Me and My Stitches: New and Awesome! Now you might be thinking...big deal...it's a spray bottle. Well let me tell you that it's the best spray bottle EVER! 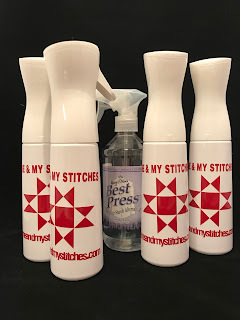 It sprays a really fine and even mist - no big splatters of Best Press on your fabric. On my ironing board, I have one for Best Press and one for water. You use much less product, with a way better result. Aunt Nancy gave me my first one and I was just amazed at how long I used it before I had to fill it up again. There is a liner inside the bottle (sounds weird, I know) that allows you to use up almost every drop before refilling. Another great feature? You can hold this bottle at any angle, even upside-down and it still sprays perfectly! Amazing, I tell you! If you have followed me for awhile, you know that we don't carry a lot of different products - mostly just things that we make - and you will never see anything on my website or in my booth that I don't use and love. So trust me on this...I'm not just making this up - these bottles are awesome. And, these are not just for ironing...my step-daughter immediately wanted one for spraying her plants. My friend, Nancy, was getting her hair cut when she noticed that the girls in the salon were using them. So trust me on this one...they are the best! Have I convinced you? If so, you can get yours on my website and we will also have them at shows. Oh...I forgot...we decided that we wanted to personalize our bottles - they were just so plain. My friend, Kim, told us about all of the cool things her kids were doing using a Cricut. Her son gave us a demonstration and sold us on it. We bought one and put it into production as soon as we got it! So the letters and star are vinyl...not some cheap sticker that will rub off or look yucky if it gets wet. It's a little labor intensive, but I think they look great (if I do say so myself, lol!). I'm sure you've heard enough about the bottles, so I will shush now - but will tell you where we will be vending this year. I'll post more details about each show when the time gets closer. Ok...go buy your spray bottle, then have a great weekend! I need one! I am so upset that I can't come and see you at Dallas!! I'm definitely sold on these spray bottles. It just took one demo at retreat and I had to have my own! They look great with your logo.